The paint went on the window today and it looks pretty good. 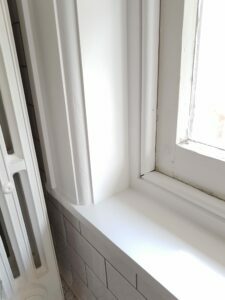 The semi-gloss sheen does a good job of fitting with the traditional look but in a cleaner way since there is no underlying heavy build-up of paint layers. There is no question that the work in preparation made the painting very easy. The hardest part of the process was cutting along the wall on the right hand side which was still relatively simple. The stool is clean and smooth now. The only parts that look at all off are the corners where the window stops come together. 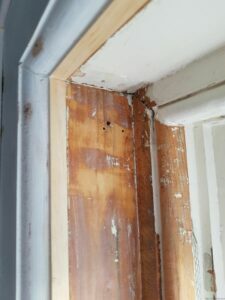 You can see a gap there which could be easily filled with some caulking but, since I have to take them off again to refinish the sashes at a later date, I’ll leave them as is for the moment. 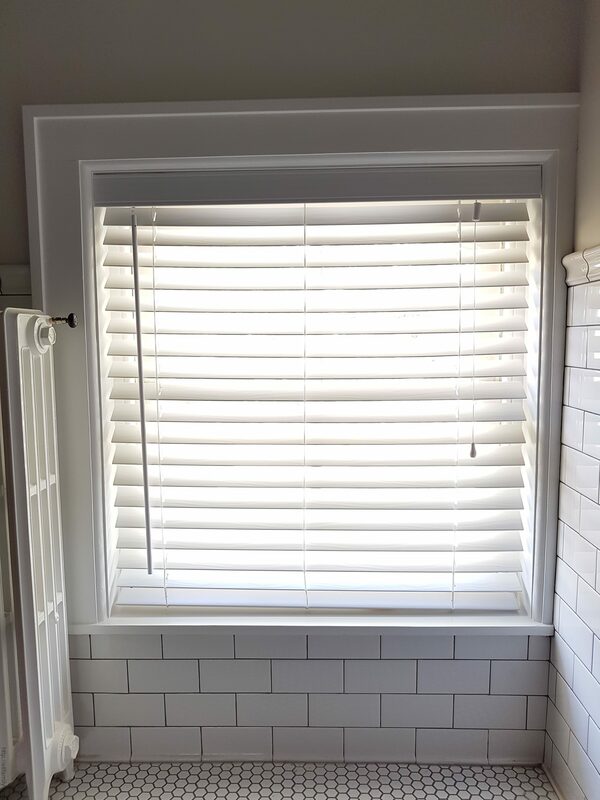 Finally, I put the blinds back in place, which is important because it makes the bathroom actually usable for the first time since the renovation began. The girls are thrilled with the new digs. Just a bit of tile work, the shower rod and curtain, and some final accessories before we can call it complete. Why not buy new windows? So now that the window is finally complete, some people may be wondering why I would spend this much time working on an “old” window. 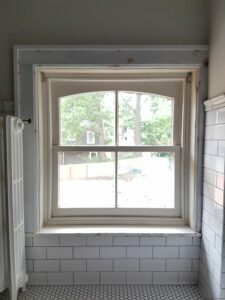 While there is the aesthetic consideration of having proper wooden double hung windows in a Victorian house, the real reason is as follows. 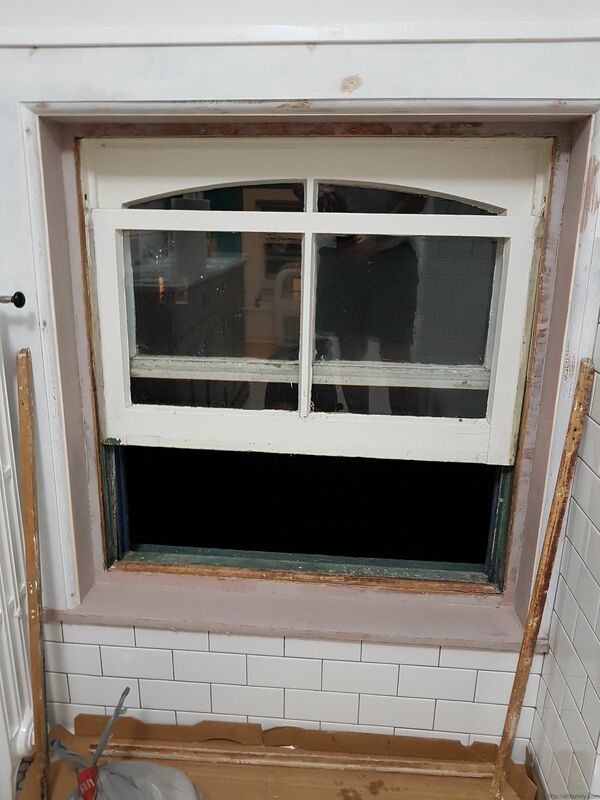 These are original windows. That means that they have survived, in a functional state, for 130 years and, with some relatively simple work, can reasonably be expected to survive another 100 years. 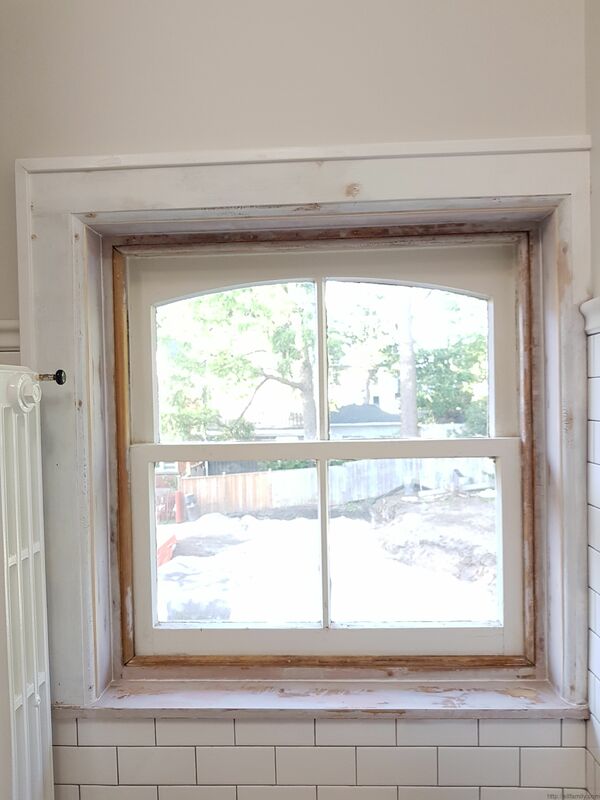 Every part of the window – casing, sashes, and trim – can be repaired or replaced by someone with reasonable wood working skills. 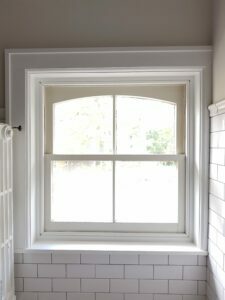 The same cannot be said for aluminium or vinyl windows that people, unfortunately, all too often turn to as substitutes. 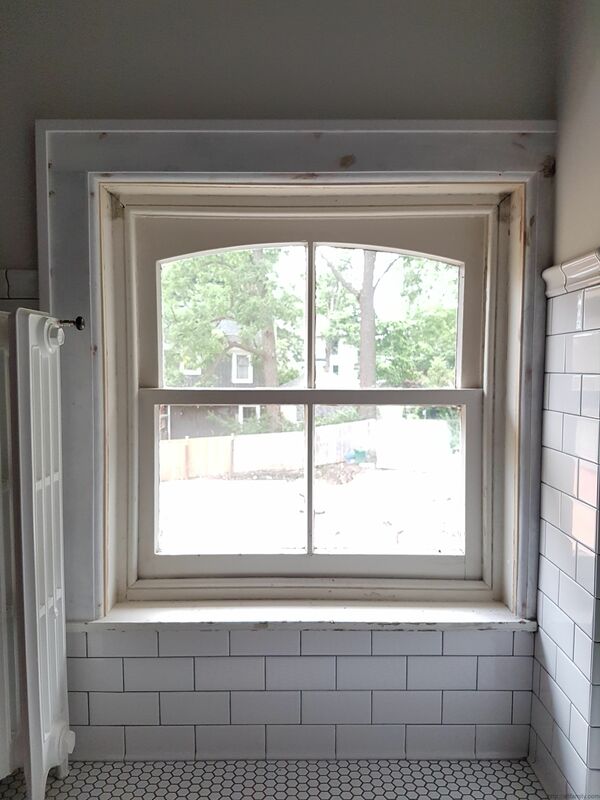 Once a conversion has been made, not only do you impact the visual appeal of the house, but it really becomes cost prohibitive to convert back to proper double hung wooden windows in future. It is true that working on these windows is a bit of a dying art. 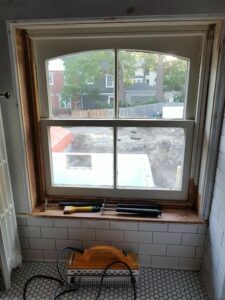 Most contractors default to replacements when faced with window challenges. 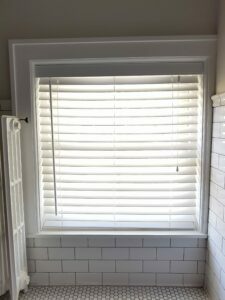 It is a quicker path to a short term improvement in the look of the windows. 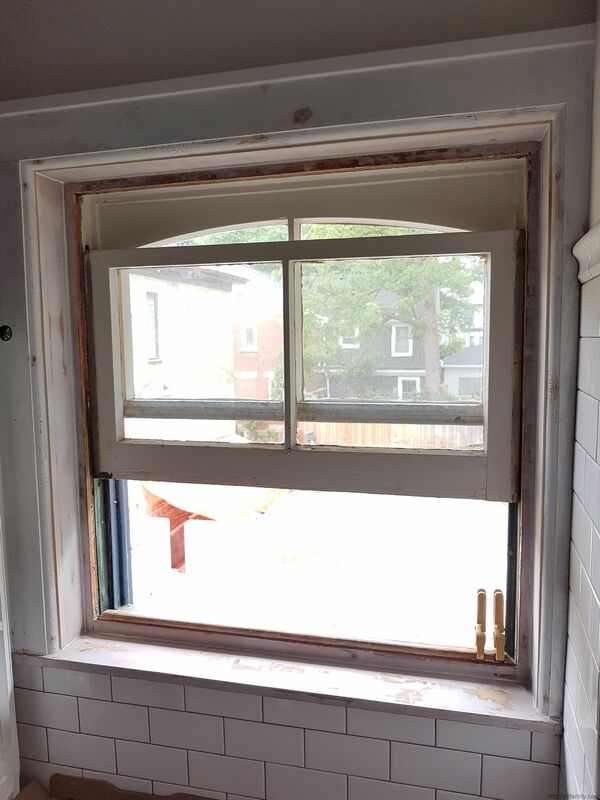 But even the best of the replacement windows have service lifetimes that are a fraction of the life of a wooden window – and that is only considering the extended lifespan of a restored window. If you include the original 100+ years of service these windows have typically already provided and you dwarf the service life of a replacement even more. On the other hand, it may be difficult to find someone to do the work for you at a price you can afford and you may end up doing it yourself (as is the case with me). Luckily, there are lots of resources available to help out. 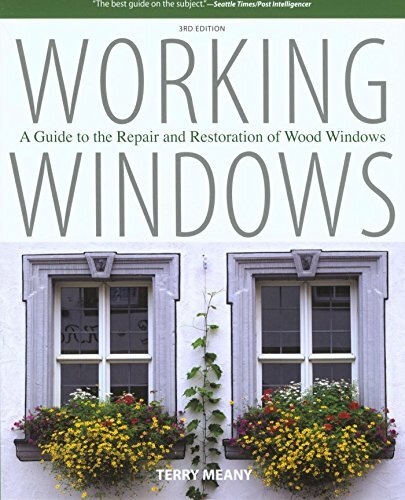 My favorite so far is “Working Windows – A Guide to the Repair and Restoration of Wood Windows” by Terry Meany. Terry is a font of information and writes in a very enjoyable and, in fact, funny way. 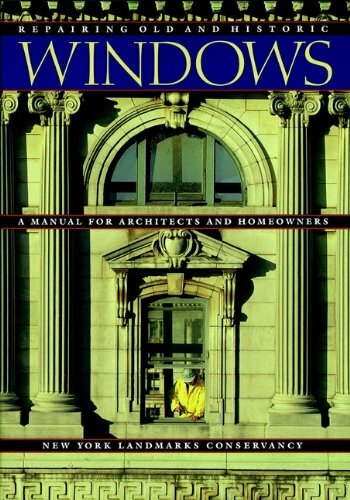 Another good source of info is “Repairing Old and Historic Windows” by the New York Landmarks Conservancy. It is full of useful information but much drier and not what I would call an entertaining read. Useful as an adjunct resource but, for the average homeowner, I’d say Terry’s book is the preferred source. So if you are lucky enough to have some original wood windows in your house, I strongly urge you to consider restoration over replacement when the time comes. 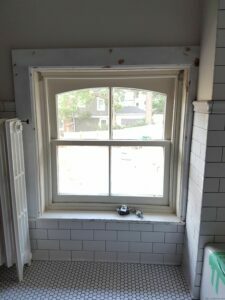 People interested in seeing the full renovation process as tracked in this blog should start here. 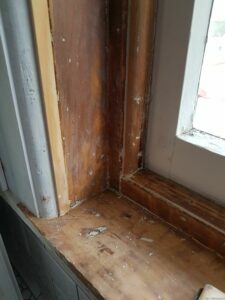 As I predicted in part 1 of this blog entry, completing the stripping of the paint required another 5 or so hours. I finally finished up around 1 AM exhausted but happy to be done. 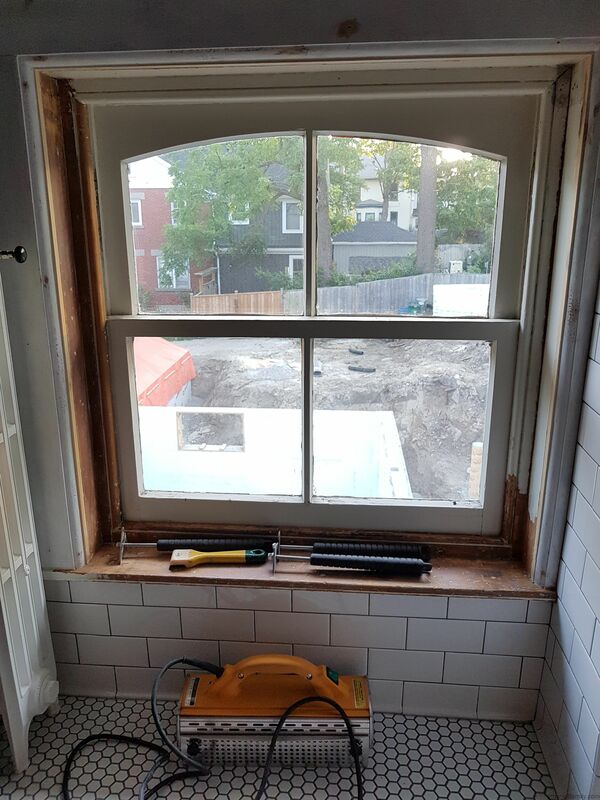 I had decided to not use stripper for this window and, instead, rely on the radiant heater and scrapers. While this works well, no matter how careful you are, there is still some gouging that occurs. 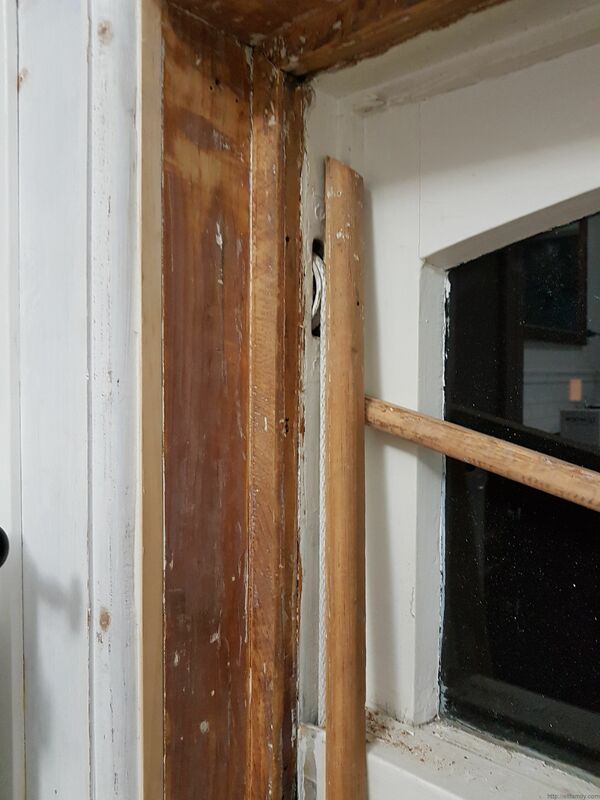 As a result of this, and the significant existing damage to the window stool, I had to pull out the polyester resin to skin coat the casing and rebuild the edge of the stool. It also provides a great way to smooth the transition between the existing casing and the pine extension that was added. Once everything was set, it was just a matter of some sanding to smooth everything out. A bit of caulk at the joints and things are ready for painting. Of course, this was hours of work but, as with most things you do in renovations, the preparation is everything. The level of effort put in at this stage is directly proportional to the ease of painting and the quality of the final outcome. I know it is hard to see in this picture but everything is wonderfully smooth and the painted results should be amazing. 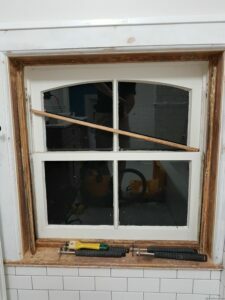 This also gave me a chance to free the window stops (the stick like pieces you can see in the earlier pictures) which will make things much simpler when I get around to reworking the sashes. For the time being though, I’ll leave them as is in the interest of getting the bathroom in working order sooner rather than later. I can always come back to the sashes but until I get the casing done, I can’t get the blinds re-installed. Tomorrow is paint and everything should come together. The many, many layers of paint that have been deposited, chipped, and redeposited over the years. 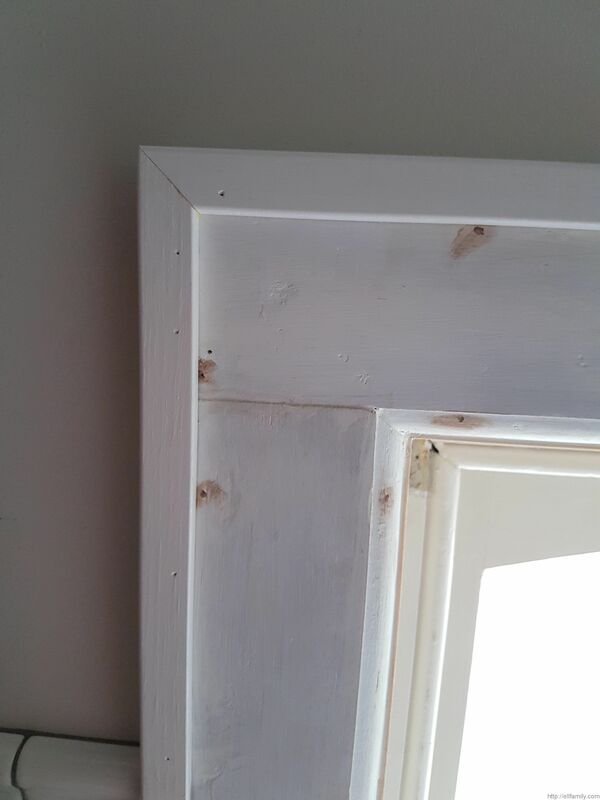 The need to integrate the strip of new pine that was inserted between the casing and the trim to adjust for the new depth of the wall. The need to address the flat, unadorned trim itself – it’s not that it needs to be fancy but should at least mirror the trim that is around the door. Repair the multitude of dings, gouges, and chipped edges of the window stool (the flat portion of the frame at the bottom inside of the window). Free up the painted on stop on the left hand side so that I can eventually take the window apart and restore it from its current painted over single hung action to the double hung function it originally had. Other things that I’m sure I’m forgetting. Unfortunately, I thought of almost none of these ahead of time. 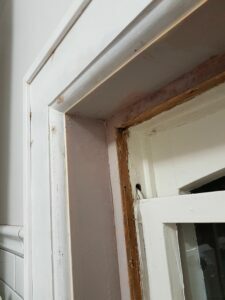 As the trim had come off during the demo, I at least had the foresight to strip them of their paint and re-prime them before installation. 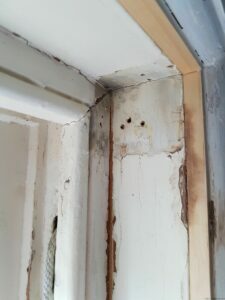 This included an epoxy repair to correct some damage to the top right corner from the removal itself. The result is what you see in the picture above – the dark patches are the filler that the contractor used when re-installing the trim. 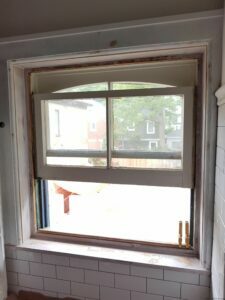 I figured an easy upgrade was to add on some L-trim on the two exposed edges so that the window would match the door. It is at this point that I should warn you to be careful what you start. As I was getting ready to paint the trim, I realized that the casing where the new pine strip was inserted would not look particularly nice if I just tried to slather yet another coat of paint over it and re-install the blinds. Alright then – guess I’m stripping the side casing so I can clean up the transition between the old and the new and end up with a lovely smooth single casing. Cut to 11:45 PM and me still trying to finish that “little bit of stripping” that I started. Finally had to call it a night. This is how it sits at the moment (if you’re wondering why it is so light out at just before midnight, the pictures are from the morning after – was too tired to even get my camera last night).